I had a bit of my Dot To Dot Brusho background left over after making my baby shower card, so I put it to good use! Using up the left overs! 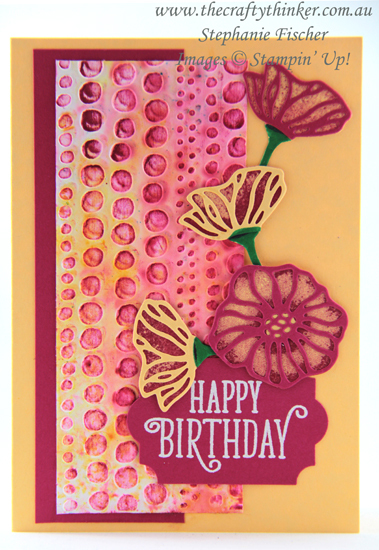 A cheerful and pretty card feating the Dot To Dot embossing folder and Oh So Eclectic stamp set. The base card is So Saffron with a little strip of (leftover) Lovely Lipstick. The greeting is from the Happy Birthday Gorgeous stamp set, white heat embossed and punch out with the Everyday Label Punch. The flowers are made with the Oh So Eclectic Bundle and the stems are coloured with a Call Me Clover marker. The following products will be retiring at the end of May (or when stocks run out) - visit the Last Chance Products to make sure you don't miss out.